A delightful and informative first reference book. Children can see how a sunflower grows from a seed, how poppies flower and make seeds, how vegetables grow and how insects and animals help plants. 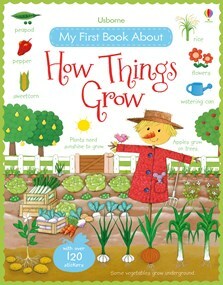 With over 120 stickers of flowers, vegetables, seeds and trees to add to the pages, a glossary, quiz and naming and spotting games. Supports basic biology as taught on the UK Primary National Curriculum for Science and includes internet links to age-appropriate websites. Also available as a hardback library edition with no stickers and a contents page and index.